ManageEngine Free WiFi Monitoring App helps monitor the availability of the WiFi networks, signal strengths and channel interference. 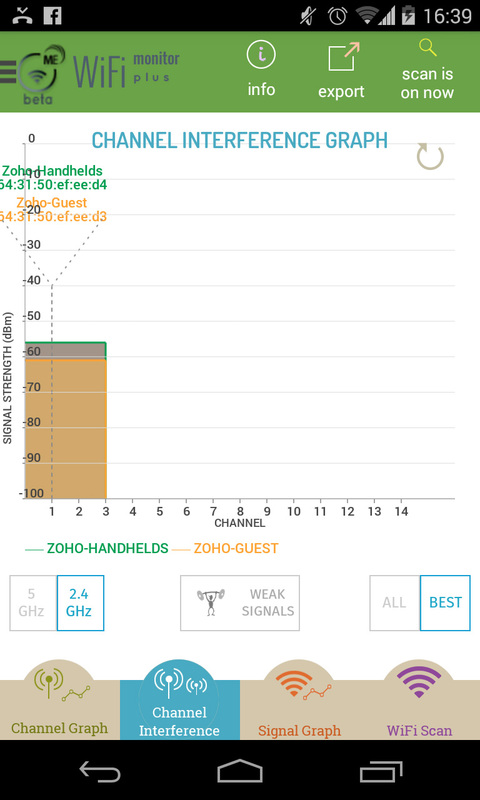 Using the WiFi Monitoring App, the availability & performance of the scanned WiFi networks can be determined in real-time. Is weak WiFi network stagnating your work? Investigate and find the reason behind your weak WiFi network with WiFi Monitoring Plus App. Trouble with your WiFi network? Scan your organization to get a list view of all the available WiFi networks and their signal strengths. Know the signal level, channel in which the signal is received, networks' BSSID and the frequency range of all the available networks. The networks are color coded based on the signal level, in IEEE standards, to tell them apart. Degrading WiFi network performance or spotty wireless connection could be a consequence of a crowded channel. Know all the available WiFi signals, the channels on which they are received and their signal strengths. 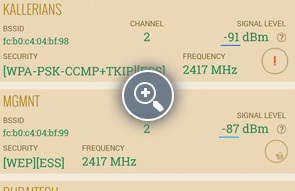 Find out the best channel to optimize your signal. Get spotless WiFi connection by connecting the router to the best channel available. 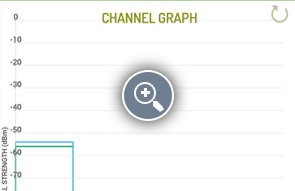 Know more details about each WiFi signal on the channel graph by clicking on the 'SHOW DETAILS' button on the analyzer mode. Are your users calling about poor internet connectivity? 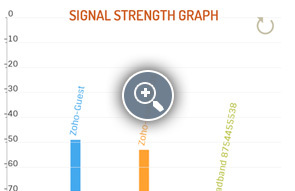 Look into the Signal graph in the analyzer mode and identify the strongest signal available in your premise. You can configure the device to connect with that signal to ensure fast and reliable Wi-Fi connectivity! Does your organization own several WiFi networks? If your answer is yes, then your organization is vulnerable to channel interference.A multitude of networks crowding a channel can hamper the speed of your internet. Highly congested areas will have signals interfering each other and thus compromising on the signal quality. Channel Interference could weaken the WiFi signals being received. Check if the channel set in your access point is being interfered. 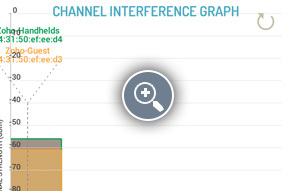 Identify the channels that overlap and interfere from the Channel Interference Graph where the signals are displayed along with its signal strengths. Identify the channel that has no interference from the neighbours! 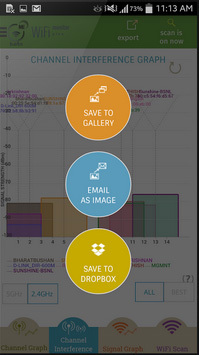 Get the live widget along with the App and enjoy monitoring the channel graphs without having to invoke the App. 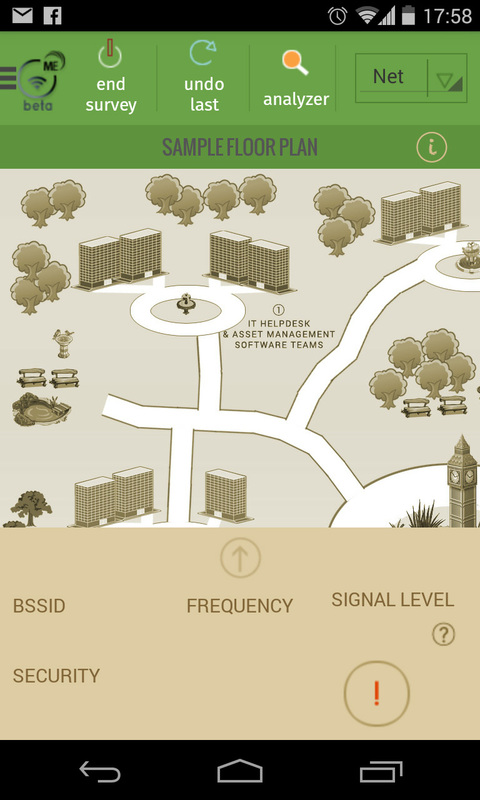 Do you have a combination of 2.4GHz & 5GHz spectrum bands in your organisation? Do you want to monitor the signals from different bands in isolation? Click on the 2.4GHz|5GHz button to pull out and view the signals at 2.4GHz seperately. 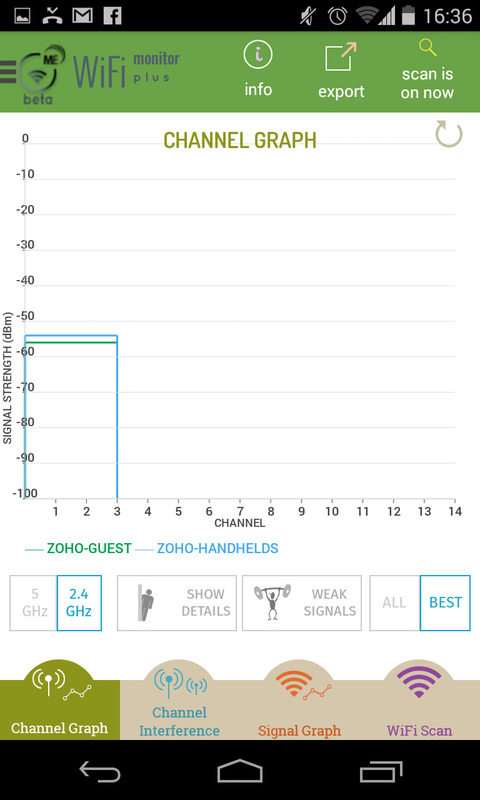 Choose between the two frequency bands - 2.4GHz & 5GHz in the analyzer mode to view the networks in the chosen frequency band. Are too many networks making your monitoring cumbersome? Leave out the poor signals & view only the best ones for a specific SSID using this option. 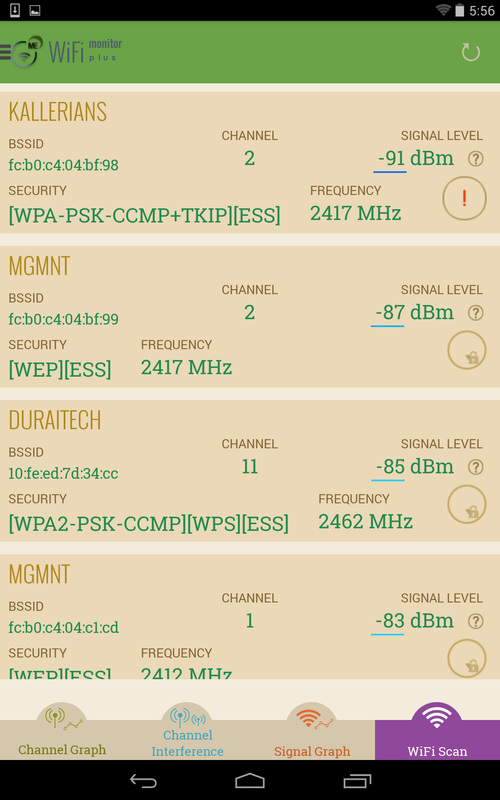 Choose 'BEST' to view the best signals received for each SSID & 'ALL' to view all the signals received, for each SSID. Narrow down your monitoring by further eliminating the weak signals. Click on the "weak signals" button to view only the best of best signals in the graph. Want to capture a particular troublesome scenario of your WiFi networks without new signals popping up and intruding your monitoring? 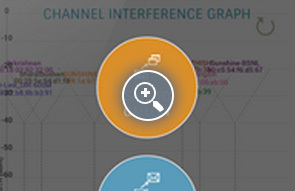 Freeze your graphs by turning off the scan & analyze the details of the displayed networks. In the tabs 'Channel Graphs', 'Channel Interference' & 'Signal Graphs', the WiFi signals are being fetched periodically and are analysed on a periodic basis and graphs are refreshed automatically. 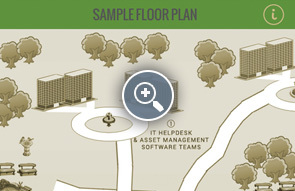 Do you wish to take stock of the details of the WiFi networks across your organization? 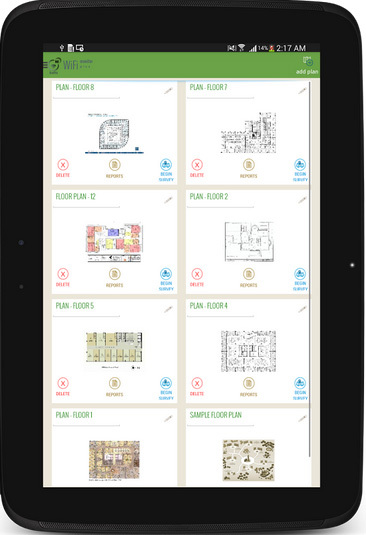 Use the surveyor mode of this app to conduct a real time survey of your organization. 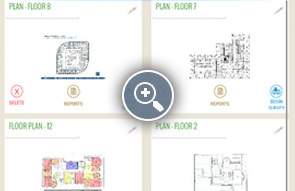 Click a shot of your premise, load it into the app and start your survey right away! Photos of your premise can be uploaded from your devices gallery too. Selected a wrong spot by mistake? You don't have to start the survey all over again. Just undo your recent selection in the Surveyor mode using this button. 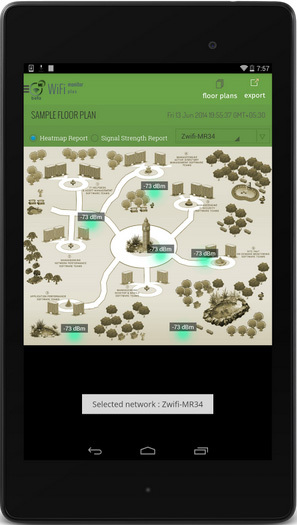 Get the report of the WiFi networks in the surveyor mode like the heatmap of the WiFi networks in your premises. 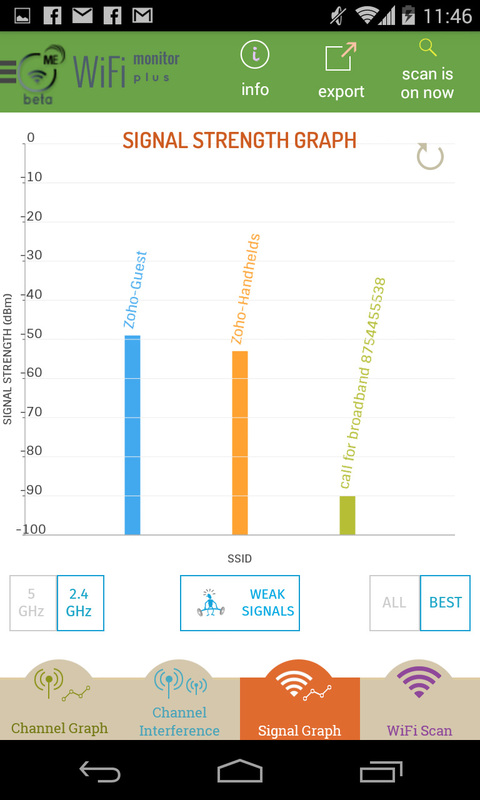 Do a network analysis of the WiFi networks using the heatmap report from this app.Get Maximum speed, best signal quality and great coverage by adjusting the location or settings of your access points. Get the report of the WiFi networks in the surveyor mode like the Signal Strengths of the WiFi networks in your premises. Export the graphs, from the Analyzer mode,that gives you a snapshot of the WiFi signals' scenario at that point in time. Save the graph as an image in your devices' image gallery, or email it or even upload it to DropBox. 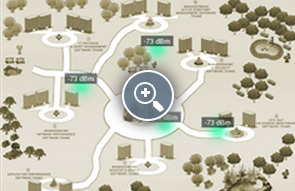 Export the survey results ,from the Surveyor mode, as Heatmap or Signal Strength reports. The reports can be emailed, saved to your gallery or DropBox.